Brain Chamber Polysacks PVT Ltd offers double loop bag cost effective solution for bulk packaging of products. Double Loop Bag is use for storage and transportation of bulk products like fertilizers, cement, fish feed, food grains. Bag is made of polypropylene material with inner and outer liner option as per needs of product packaging. Applications – Powder, Granules, Pharmaceuticals, Food Grains etc. 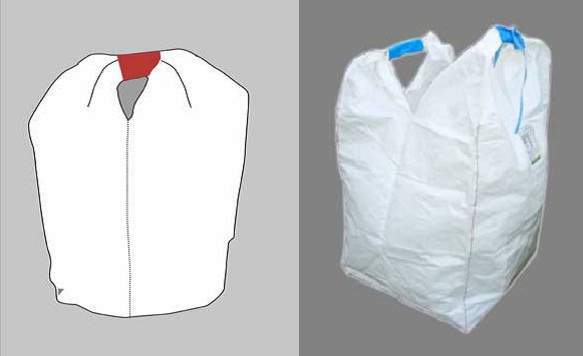 Standard FIBC has 4 loops on fabric use for carrying dry flowable material. Cone shape bag whereas loops strongly stitched on fabric for easy handling. Tunnel Loop Bag has two parallel loops for easy lifting. A bag with top opening sprout and loops are stitched strongly for easy handling. Ventilated Bag keeps air ventilation in bag use for vegetables. One loop Bag known as single loop bag has an one fabric band stitched on main fabric. 2 Loop Bag attached on main fabric for easy handling through forklift. Container Liner Bag use for transporting bulk quantity material easily through 20 Feet container by shipments.